In 1970 when I was living in London, the Rhodesian situation continued to be a thorn-in-the-side for the British Government. Ian Smith’s “illegal” regime had been inflicted with all manner of international sanctions, yet the country managed to survive, even thrive, helped in no small part by the South Africans. I can’t remember precisely where or when I read an article about Ian Smith and the-then South African Prime Minister, John Vorster, having a meeting after which they were presented by someone with ties that had been made to order by the Royal Appointment Tailors, Gieves of Savile Row. The article carried a photo of the two famous politicians wearing the ties. The ties looked like your usual public school tie, narrow, blue with green and gold stripes, and they had the letters COBC printed on them which the article said stood for “Commonwealth Old Boys Club” - Smith and Vorster certainly being Old Boys of that institution! Me, in poshest voice possible: ‘My father used to be in government in the former Northern Rhodesia and he knows Mr. Smith and therefore qualifies as an old boy of the Commonwealth. We then discussed price which I cannot for the life of me remember exactly, but I think was surprisingly reasonable given it was a Gieves one-off original - probably around ten pounds. A day later a London cab arrived with a man with wearing a top hat and carrying a plain and unmarked box in which the ties were carefully wrapped in tissue paper for my “approval”. I paid for them by cheque. My husband Peter wore the tie occasionally and delighted in telling people the story behind it, until it became too politically incorrect to do so. My father Bill last wore his COBC tie when he met Ian Smith on a private visit to Canberra in the 1980s. Smith recognised it of course and Dad was able to tell him the story of how he came to have one himself. The tie shows it was made for Benson Investments of Cape Town. If anyone reading this knows more about these ties or owns one, or knows of others who do, I’d be delighted to hear from them. ​In 1924, my Dad was just 19 years old (he didn’t turn 20 until November) and made his first adventurous trip on his own, travelling all the way from his home in South Shields on Tyneside to London so that he could attend the 1924 British Empire Exhibition held at Wembley between April and October. 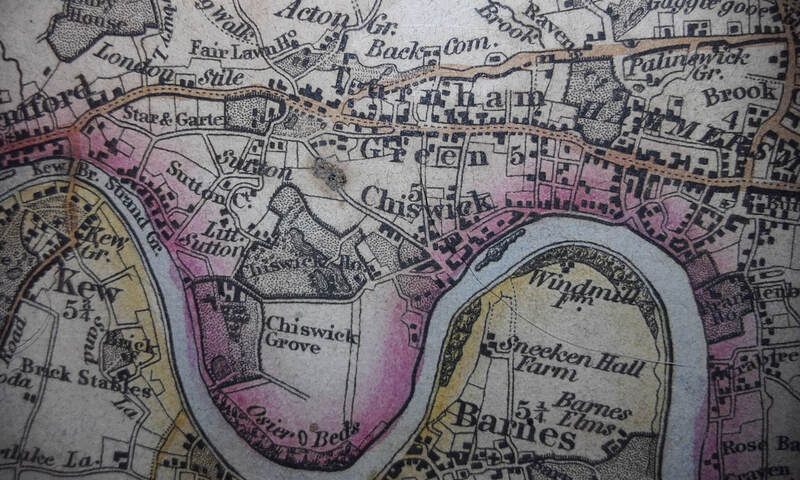 Obviously excited at this prospect, he would have told various family members about his plans and one of his aunts, Bella, who lived in rural Northumberland, told him he would need a map in order to get around London and so she gave him hers. 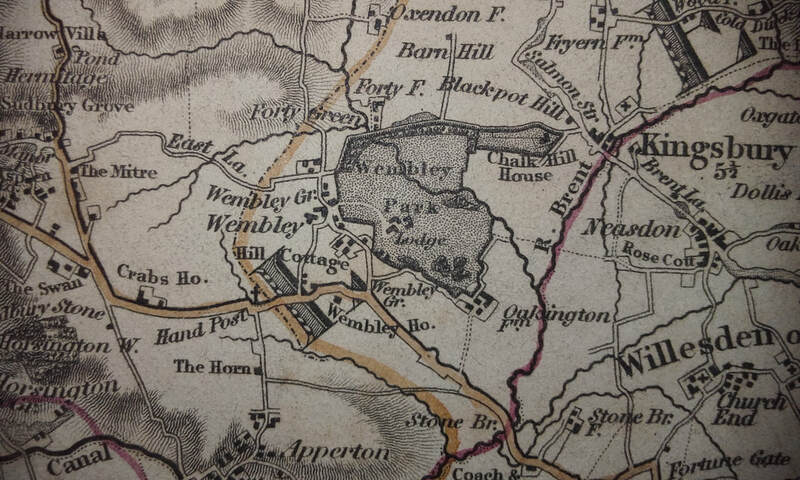 When my Dad arrived in London, he was somewhat dismayed to find that Aunt Bella’s map was “a bit out of date” and not much use so he had to get a new one in order to find his way to Chiswick and Wembley. 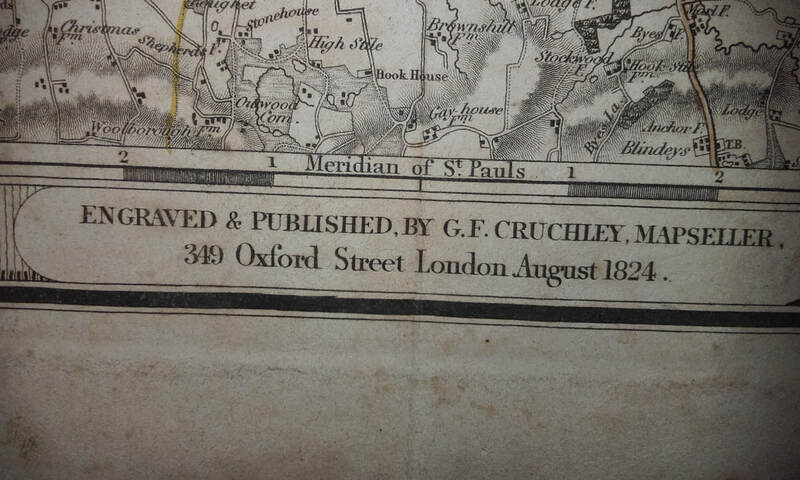 I’m not sure if he told her when he got home, but the experience has gone down in family lore ever since and on a visit to England a few years ago, I was delighted to find this “out of date” map still in existence, saved together with a copy of Dad’s guide to the Exhibition. It is interesting to think that in just a few more years the map will be another 100 years out of date and even more useless than it was in 1924! ​The blue plaque wasn’t yet in position when I used to look out at No. 28 Hyde Park Gate every day from where I lived across at No. 19. ​Occasionally you would see the odd person or small group milling about in the road and taking photographs as it was where Sir Winston Churchill had died a few years earlier. There were quite a number of people living close by that might attract the odd paparazzo as well. Some residents that I recall included an actor who became more famous as the “Schweppes man” than anything else he did owing to his TV commercials (see below). There was also Princess Lee Radziwill (sister of Jacquie Kennedy) and actor Christopher Plummer and no doubt others of whom I was unaware. Hyde Park Gate is a strange street. It is in two parts leading off Kensington Road, one road is straight and the other ends in a circle. They are unconnected although have the same name. The Australian High Commissioner lives in the round bit, at No. 45, also known as Stoke Lodge. No. 19 was owned by an Indian gentleman whose name I've forgotten. He lived downstairs and had subdivided the upper floors into flats that he leased to groups of young women. I shared with three others and my bedroom looked out over the small enclosed back garden that was not accessible to us and which backed onto the mews of Queen’s Gate. The landlord was a pernickety character rather too interested in what his tenants were up to and he liked to see who came and went. He did not approve of male visitors in general, and was outraged if he suspected any of them might have dared to stay in the flats overnight. He was quite likely to bail you up in the main hall and demand to know if you had had a man on the premises overnight and why you should be allowed to continue to sully his domain with immoral doings. Nobody ever told him the truth of course and I don't know that he ever acted on his suspicions by kicking any girl out, but his attitude created much amusement for us and our respective boyfriends, who found various ways of dodging in and out unseen. Many male visitors were there in the innocent capacity as family members or casual friends looking for a convenient London sofa to kip on overnight but our old-fashioned landlord didn’t appreciate it was the dawn of the 1970s and things had changed! My tiny bedroom must have been a valet's room or gentlemen's robe at some stage as one wall had many drawers still labelled for gloves, handkerchiefs, neckties, etc. * The building generally was pretty shabby and run-down, but it was a great address to give if one wanted to open a bank account, cash a cheque or purchase something over the phone or by mail order. I once ordered a couple of unique custom-made ties from Gieves gentlemen's outfitters (an interesting yarn for another MMMusing at some stage) and was astonished when my “on approval” immaculate package of ties arrived in a taxi and was carried to the door by a bloke wearing a top hat! A couple of years ago I stayed in another building with links to Churchill - the Londonderry Arms at Carnlough in Northern Ireland. 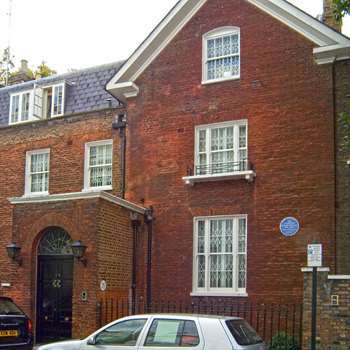 * A weird bit of serendipity when researching a completely different topic I came across a newspaper article that reveals that 19 Hyde Park Gate was once the home of Sir Arthur Temple Felix Clay, a Baronet who was pretty handy with a paintbrush. Some of them can be seen here. ​On International Women’s Day it is interesting to look back at how things have changed in the education of girls and women - definitely so much for the better. Among my recipes collection is an old exercise book dating back to 1959 when was I was in high school in Africa. It is from my “Domestic Science” class and leafing through brings back a lot of memories which, thankfully, I can now laugh at although at the time it was a deadly serious and important subject and you needed to pass it to graduate. Some of the most hellish women were Domestic Science teachers and I loathed the subject with a vengeance. Sewing was my biggest bugbear. If anyone has ever experienced the torture of sewing a “French seam” by hand at the age of 9 or 10, then they might know what I mean. Even doing one with a sewing machine can be a challenge with slippery fabrics, so imagine trying to do this by hand with a teacher looming over you, shouting at you if your stitches were too big or crooked or your seams wonky. If you were shaking so much you pricked your finger, drew blood and marked the fabric, then you were up for a big fail that could include detention. But the teacher we had for Cooking truly had the ability to haunt my dreams. Miss P. had long hair braided over her head like those German female concentration camp guards with an expression to match. Her mark on my life is in that recipe book where I see she docked marks for spelling mistakes. She gave me only 5 1/2 out of 10 for my writing up of a Queen Pudding recipe because my handwriting wasn’t neat enough; obviously your writing being more important than your cooking capability. I also lost marks for not separating eggs properly and getting a bit of yolk in the white. You were also forced to scrub floors and wooden tables clean after every session, another area where there was the potential to lose marks. The fact that most of us girls would have had African servants who did the scrubbing is a major irony in the context of this subject that was not lost on us. Frankly, I preferred the scrubbing to the writing up of recipes - I could use it to expunge my loathing of Miss P.
It took me a many years to recover from Domestic Science. And only after forced rehab - I made myself learn to sew a little, to knit and to cook without worrying about how to spell “meringue” - and while never a genius in any of these areas, I finally came to enjoy some aspects of DS. Scrubbing floors and tables is another matter (thank goodness for modern surfaces). ​While discussion of present-day politics is always best left alone, the outrages from the new American administration are making even the most reluctant individuals like me get very hot under the collar and vocal. Take this, for example, from The Independent. Assuming it isn’t “fake news” - and that’s another worrying problem - this holder of Britain’s highest award for valour, the Victoria Cross, which he won fighting with the British Army in Iraq, has run foul of the new American regime. Maybe if he had a white skin he would have been OK, but the blatant racism also involved is abhorrent. If you are a frequent traveller you may have to be careful of what’s stamped in your passport. If you’ve been to Iraq - or any other place that Mr Trump arbitrarily decides is dangerous to Americans (Australia, watch out!) - I recommend you get rid of the thing by means that do not appear deliberate - perhaps the dog can chew it up - and apply for a new one. I should have done this back in 1969 before my own humiliating experience on entering Britain after an ocean voyage from Canada. The officious customs and immigration people at Southampton held me back until every single passenger had left the ship and I was forced to sit and wait until they decided to interrogate me, as an “undesirable”. Never mind that I had a valid British passport but because it had originally been issued in Salisbury, Southern Rhodesia, it stamped me with the mark of Cain. The passport was issued in December 1961 when Southern Rhodesia was still a self-governing Crown colony and fully part of the British Empire and Commonwealth and thus a perfectly valid place to obtain a British passport. But come 1965, that colony had decided to go its own way and declared independence from Britain (UDI), calling itself just Rhodesia. In the early 1960s, I had lived in England and gone to college there and where I had my first job. Then, together with my parents, the same passport was used when we immigrated to Canada, in 1964. In 1967, two years after Rhodesia declared UDI, I returned to the UK on a working holiday and had no problem coming and going between Canada, the UK, and various countries in Europe. Thinking it might be an interesting career path, and showing how naïve I was, I even applied for a civil service job at the Foreign Office, only to be told that due to my unfortunate background - a Russian mother, Rhodesian-issue passport - I was unworthy of entering the halls of British officialdom and shown the door pronto. I was actually quite chuffed to get knocked back on the assumption that I had all the makings of a spy! But Britain increasingly toughened its attitude and sanctions against Rhodesia and had become particularly vicious towards anyone who had Rhodesian links - ironically this could apply to anyone; blacks, Indians, as well as whites. British assets belonging to Rhodesian residents were frozen (another experience that impacted my family and wasn’t resolved until as recently as 2014), mail from that country was surcharged or just not delivered in the UK, travel discouraged, long distance phone calls were almost impossible. Abuse from socialists or left-wingers was another hurdle I had to face even though I personally had nothing to do with UDI as I’d been born in Zambia, the now independent African country to the north of Rhodesia, but had applied for a passport when Salisbury just happened to be the nearest geographical place to get one. But back to that day in 1969 on board the ship. I was actually rather frightened with my shipboard friends all gone ashore leaving me sitting there alone. Would the shipping company be forced to carry me back to Canada? What if Canada didn’t want me any more either? Would I be sent to Rhodesia? At least I had an uncle there who would take me in. These thoughts whirled around my head. Finally, a plainclothes man sat down with me, a more sympathetic individual than the others, and said that I would be allowed in on the strict proviso that I immediately apply for a new passport showing my residence as England, even if technically it was Canada, because then I shouldn't have any trouble anywhere. "Thousands of Jews fleeing Hitler could have found a safe haven in central Africa, had they but been aware of it. Sadly, efforts on their behalf by well-meaning outsiders were thwarted and did not bring results. The reader can judge the extent of this historical failure and decide for himself whether a conspiracy was involved." At the time I was born just after World War 2, a polio epidemic was raging through our community and people tried to avoid places where they might have contact with sufferers, and that included unnecessary visits to the local hospital. This meant that my mother, recovering from a near-death experience during an emergency cesarean, had few visitors apart from my father. But one woman did come to see her regularly, unafraid of infection or contamination. She was Jewish, the wife of a prominent local businessman for whom my father managed a department store. Despite their religious differences (my mother was Orthodox Christian) they had the Russian language in common and this woman would have understood how difficult it was to have been, firstly, a refugee from your own country and, secondly, a foreigner in an environment that was not always welcoming, not to mention having no-one from your own family around you to help with your new baby. Among my childhood mementos is a white felt rabbit that was her gift to me as a new-born. Whether she made it herself, I don’t know, but I still treasure it today. Its significance for me has grown over the years as I have come to appreciate how much my mother must have valued this woman’s friendship at a time when she would have been at her most vulnerable. Through the wonders of the Internet, I have been able to find out a little about the woman who gave me the rabbit. She was Reeve Gersh and below is an image of her gravestone in Massachusetts where she and her husband lived out their later years. And this link will tell more about the Gersh family of Kitwe. After working for Maurice and Harry for some years, my father later set up his own accountancy practice and many of his clients were Jewish friends and associates of the Gersh family. Through their connections to other prominent Jews throughout Southern Africa, including the future Prime Minister of Rhodesia & Nyasaland, Sir Roy Welensky, they were instrumental in helping my father when he decided to go into politics. Our world is again embroiled in refugee turmoil and the turning away of desperate people. For anyone baffled at how so many countries turned their backs in the 1930s on the Jews destined to suffer under Hitler, it is worth reading Frank Shapiro’s revealing but also sad and frustrating tale of missed opportunity and failure. 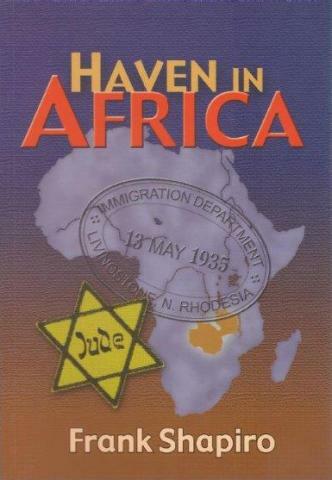 Northern Rhodesia was the one country to which countless European Jews could have escaped had they only known about it and had there not been deliberate suppression of that knowledge in the wider community. Another book that has chapters on the Gersh family is this one about their uncles, the famous Susman Brothers (also connected to Marks & Spencer). ​​A weathered stone wall; a battered antique teapot; a well-thumbed Bible. Such simple things often set me wondering about their history. Who built the wall, when, or why? Was the pot a special gift, and who first drank its tea? Whose life was helped, or perhaps hindered, by their faith? Some psychics say material objects can carry traces of their past and while I wouldn’t go as far as believing this applies to everything that’s old, a deeply-sensed connection to an object can be the inspiration for creativity in many ways and is a route especially cherished by writers and novelists. Unless we are lucky to already know something of the item's background, mostly we can only speculate and use our imagination to fill in the gaps. Early in my working life, I received training in a Vancouver legal firm in probate and administration of wills and estates. While most cases were routine, there were some that created havoc and resulted in years of litigation. A couple of the more memorable included the estate of a woman who had made a huge fortune in the lumber trade but who placed the onerous demand on her husband that he must never marry again otherwise he would lose his trust inheritance; another individual had sidelined his entire legitimate Canadian family in favour of a previously unknown illegitimate one across the border in Washington State. And then there was the file that landed on my desk that brought with it a definite chill. But this was not the chill of fear, I hasten to add, but one with palpable echoes of Canada’s far North, of life-and-death adventures in frozen wastes. It carried the chill of the Arctic. These were the effects of a man who had lived his latter years in modest circumstances and left an equally modest and non-controversial estate. Along with his Will, there were a number of personal items: letters, notebooks, part of a manuscript. As I handled and itemized the objects, I began to understand their huge significance and goose-bumps raced down my spine. Although I knew scarcely anything about him at that stage, I sensed I had been given the immense privilege of touching real history. This recent article in the Vancouver Sun explains why we should forget all the fuss about [John] Franklin and why Henry Larsen is Canada’s true Arctic hero. Below is a YouTube video featuring the daughter of Henry Larsen who tells his life story in detail and with comparisons between him and his hero, Roald Amundsen. Amunden's vessel Maud has recently been raised from the Canadian Arctic seabed and will be the subject of a new museum in Norway, while Larsen's St Roch is a permanent exhibit of the Vancouver Maritime Museum. But her future is always uncertain and, like so many other historic vessels elsewhere, she is ever at risk of decay and at the mercy of bureaucratic squabbling, lack of funding and, not least, the lack of curiosity in newer generations who have been raised without wonderment or understanding what it really means to be able to touch history. It was sometime in 1953 and my Dad had an important business meeting scheduled in Salisbury, Southern Rhodesia [now Harare, Zimbabwe], and decided to fly to save the long road trip down from the Northern Rhodesian Copperbelt, but when he arrived at Ndola airport he was promptly “bumped off” his flight because a woman far more important than him had demanded a seat. Naturally having been taught from an early age that a gentleman always gives up his seat to a lady, Dad grudgingly complied but without being able to get on another flight for days, he ended up having to drive all the way to Salisbury and back anyway - a total journey of over 1,000 miles (1,600 km) - much of it on rough and corrugated dirt roads. This episode rankled Dad for years and whenever a movie starring Gene Tierney was on at the local bioscope (our name for the cinema), he refused to go as a matter of principle. Even many years later when many of the movies she had been in were relegated to TV, as soon as he saw her name in the credits he'd still go off at a tangent about the time he had to drive 1,000 miles because of this Hollywood movie star throwing her weight around. Except there was a one major problem with this. Mum and I kept telling him he had it all wrong. Gene Tierney wasn’t the culprit, it was JEANNE CRAIN, but for as long as he lived Dad refused to admit the mistake and kept using poor Gene Tierney’s name in vain. they shadowed the ‘dead man of the Transvaal’ they had to bring back alive”. Dodging the odd lion fang may have been a possibility but considering boas only coil in South America, this was a big joke to those of us born or raised in that “screeching jungle haunt” and some of the biggest screeching that went on is when these films would be shown at the Saturday afternoon matinee at the bio when us kids saw film versions of our continent which always resulted in a lot of laughter, cat-calling, whistling, booing and general mayhem. Africans were stereotyped, shots of animals on the rampage were always speeded up to very loud music and the actresses still managed to keep their bras pointy and their hair salon-fresh as they swooned into the leading man's arms. This was his kind of manhunt - all danger - and his kind of woman - somebody else's! This review from the New York Times pretty well sums it up as a "harmless piece of junk". I rather like the suggestion that "Miss Crain appeared spellbound by a bongo-bongo campfire that sounded like 'Deep in the Heart of Texas'.". Every colorful scene masks treachery and cunning! Every stolen kiss invites Death!